Selection: Bonus Track not included on the original vinyl – Brilliant Corners, in which Elvis vocalises the part of Sonny Rollins tenor. The record collecting community was today rocked by the announcement on a popular jazz collecting blog of the sensational discovery of a Blue Note title that has remained undiscovered for over fifty seven years. Collectors commonly assumed Blue Note BN 1553 to be an unissued catalogue number. It now appears that it was indeed allocated by Blue Note President Alfred Lion, to one of the most audacious projects ever attempted by the great Blue Note jazz label: the recording of tunes of Thelonious Monk by rising singing star Elvis Presley. Recently discharged from military service and not then knowing his future destiny, the young recording singing star accepted the challenge of vocalising the tunes of one of the founding fathers of the Bop movement, the highly individualistic pianist, Thelonious Monk. Grasping tunes that had all but defeated many of the great horn players, Elvis quickly mastered Monk’s quirky melodies with ease, vocalising wordlessly the melodic twists and turns of tunes such as Epistrophy and Straight, No Chaser., even finding opportunities to curling his lip and synchronise his novel hip-swivelling technique at crucial points in the tunes. Recorded by master engineer Rudy Van Gelder, the tapes of the Elvis Sessions were mastered, and a first pressing run delivered to Alfred Lion. Ever cautious, Lion concluded that the young and relatively unknown singer Elvis was too great a risk, unlikely to ever achieve commercial recognition, and decided to discontinue the project. The tapes of the Elvis Sessions remained in the Blue Note vaults undiscovered over five decades, even overlooked by Blue Note archivist Michael Cuscuna, who mistakenly concluded the description on the tape box was a practical joke. 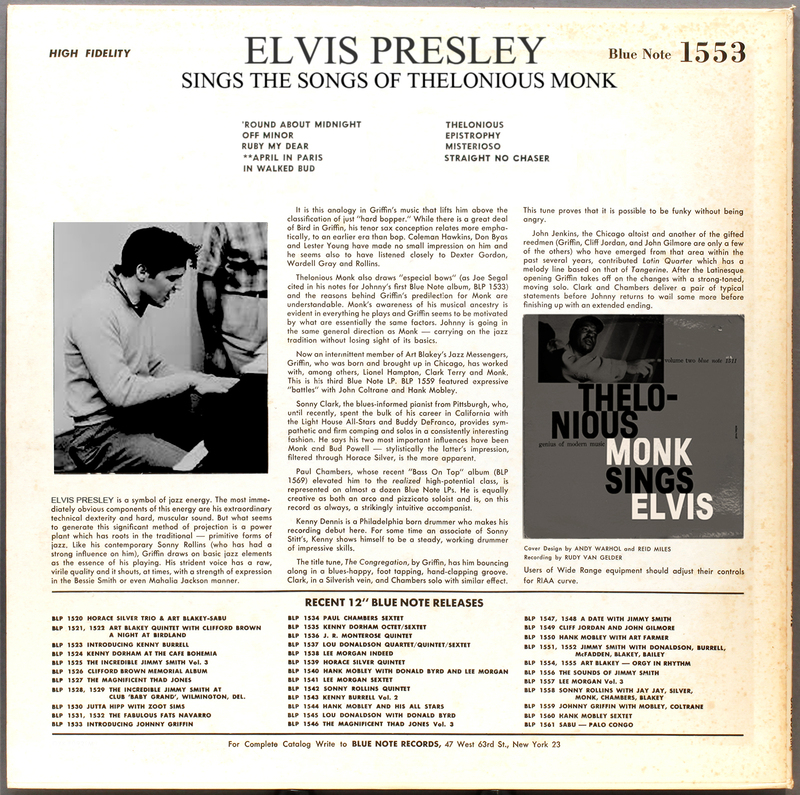 The existence of the first pressing run of Elvis Sings Monk has only just come to light. A crate of original mint sealed copies of BN1553 was recently discovered by the US Postal Service’s Misdirected and Lost Internal Freight Service (US-MILFS) who , as a public service, alerted Blue Note collectors of the existence of the find through internet on-line journalists and blogs. LJC has secured an allocation of twenty mint sealed copies of the hereto missing Blue Note BLP 1553. As a mark of appreciation of all the kind comments and loyalty of followers of LJC, the first twenty applicants will receive a free postage-paid copy of BLP 1553, on a first come first served basis. This offer must come to a close precisely at noon, April 1, 2014. This entry was posted in Jazz, Thelonius Monk and tagged Blue Note, Elvis Presley, Thelonious Monk by LondonJazzCollector. Bookmark the permalink. What is curious is that your review and the liner notes fail to identify the trumpet player on ‘Round About Midnight, and Misterioso. Rumor has it that Elvis was barnstorming with the the Louisiana Hayride, and came across an elderly trumpet player who he said could raise the roof one moment, then summon the angels the next. When asked who it was, he just said “some cat named Bolden….and I made sure to bring him up to NY when I did that Monk record”. G-d gave us 1 mouth but two ears (and a musical mind that need not have an external stimulus to hear music), listen hard and you can imagine this splendid recording! Deliver it Round Midnight and I’ll Return to Sender. I think you could get Elvis Costello to sing Round Midnight! It’s done in German (“Blue Monk” means “Moonlight” in German) because Elvis was staying in Germany as a member of the U.S. Army at that time, and the song was a tribute to his German fans. This is much ado about nothing. The real find, that they won’t disclose is Elvis’s interpretation of the sonnets of Ted Cruz.. now those are something to write home about. I just hope they release them on 180gm Virgin Vinyl. what a find! Unlikely, but Dylan took in Sinatra. ooops. I meant The Beatles “A Day In The Life”, of course. While I’m back …….. listen to Eddie Floyd’s “On A Saturday Night” and then play The Beatles “Revolution” right after ……….. The “mystery”chord at the close of “Day In The Life” – Monk, uncredited. Please, send me my copy!!! I would love one also if this isn’t an April Fool’s joke. If it is a joke, good one though! Same day as the revelations about Bob Dylan’s years in the Salvation Army broke! Strange. Osmond Brothers sings Billie Holliday … next year !!!! Jerry Lee Lewis doing Bud Powell’s parts is also one hell of a treat! I am totally shocked by this package! I have to hear this!!! Makes you wonder what Monk thought when he heard it. Id LOVE a copy of this, how can I get one?? How do they decide who gets a copy? I’m a little confused….but I absolutely want one!!! Strange as this record may sound .. I would love a copy !! If this is true, this might be the single most important discovery in jazz and rock history. Please have me with one of these. Sure! I’d love a copy! I really hope these posters are only joking…if not, stay by your mailbox guys, it should arrive any day now! Would be great to hear this!! Would be great to hear this!!! I would love to apply to receive a copy! …a previous commenter did an online search and found nothing…that should tell, besides being april fools day, if anything, it would be wishful thinking …just like elvis presley would still be among us at least rockin’ his chair and giving his point of view about music , et al… from what I know, in the 50’s there were hard lines between people of different skin colors and not any substantial mixing of genres either… times are somewhat better than those days, but a lot remains on the table…studio matchups could still be done in fun, but that depends on getting the record labels to license using songs…. ok, you all joking about April 1st: I do NOT, for decades I’ve been fooled around ’cause I SAW THE LIGHT this great spring day. Still: it makes me wonder to what extent Elvis was into Jazz. I’d never of it, but thanks to this post I had to say it. Any Presley connoisseurs out there who have a clue? I prefer Sun Ra’s version of Viva La Vegas…. In answer to your question about to what extent Elvis was into jazz, I can tell you that while he wasn’t a fan of it as far as being a “connoisseur” but he had a genuine respect for it. He told a couple different interviewers early in his career he had great respect for jazz musicians. But it wasn’t a music he listened to too much as it was so different from what he was doing (I’ve read & listened to some of those interviews. They’re archived and documented on some Elvis sites. Good stuff. He always came across as honest, self-deprecating, and down to earth. Some newer celebrities could learn couple things from listening to Elvis’ old interviews ). He was a fan of Nat King Cole and had a Duke Ellington album for years sitting right next to his personal record player at Graceland, along with many of his favorite gospel, opera, blues, pop & country artists albums. Plus, his first band mate Scotty Moore said in the early days when they were touring all over the South trying to make a name for themselves one of Elvis’ favorite stations he would always tune in to when they were on the road between gigs was a Jazz station coming out of New Orleans. So, Elvis interest was probably more than people realize. 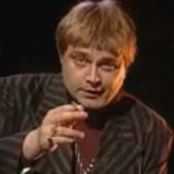 But just not big enough that it’s something most people associate with the various other types of music he was into. Music history writer Peter Guralnick keenly pointed out Elvis had a photographic memory for facts and was a Musicologist, or more to the point, he was an Ethnomusicologist …without a degree. That’s a great point many music fans don’t think about with Elvis, and that Elvis doesn’t get enough credit for. He not only was familiar with multiple different genres of music but more important he understood them to the extent that he knew the history more so than many other musicians of his day. This is why many bluesman, gospel legends, Country, pop, or Rock icons that met Elvis, and spent time talking music-shop with him, pointed out over the years in their interviews Elvis knew as much as they did …if not even more … about the subcontext of where each music came from as well as many of the lesser-known artists going back to the early nineteen hundreds. He truly had a knowledge and respect for music history in America beyond the scope of of many of the other people over the years that have written books about it. I think that’s one of the things I always respected about an artist like Elvis is he’s one of those artists, as some other people have pointed out, the more you research him and keep peeling away the layers, you keep finding more surprises underneath. Interesting to note Louie Armstrong proclaimed to members of the press in 1957 he wanted to record with Elvis, and a number of jazz folks over the years, such as Lionel Hampton and Nat King Cole either defended Elvis or spoke words of praise for him when critics were quick to dismiss Elvis. ( actually Nat and Elvis met and became friends. Nat even tributed Elvis by doing a couple of Elvis songs on his own TV show in the 1950s. Nats performanes can be found on youtube. There’s even a great story about Elvis and Nat running into each other in 1957 at a Halloween party in Hollywood and Nat was dressed as Elvis for his costume….painted on sideburns and jacket with collar popped up 🙂 Witnesses said Elvis got a huge kick out of it. Nats daughter Natalie verified in the Cole household the whole family always had tremendous respect for Elvis). I find these things interesting in that it gives a better understanding of fact that we music fans sometimes forget many of these icons had a greater respect and appreciation for each other than we as fans might otherwise take into consideration or understand. Anyway… my lunch break is over. Hope this info gave you wider scope of understanding. Andy, I forgot to ask: does that LJC stamp in the trail-off vinyl stand for Ludy Jan Celder? Kudos on some fantastic Photoshop skills, and you had me LOL’ing at (US-MILFS), I nearly sprayed the LCD screen. Great way to celebrate 1/4/14! If this is real, I would love to see this in person. Any I was had by April. As a big fan of both jazz and rockabilly, this would be a great record. What about the band? Maybe Elvis on vocals and guitar with a smokin’ rhythm section and a few horns, something like Walter Davis Jr., Paul Chambers, Art Blakey, Lee Morgan, Lou Donaldson, Hank Mobley and Curtis Fuller. 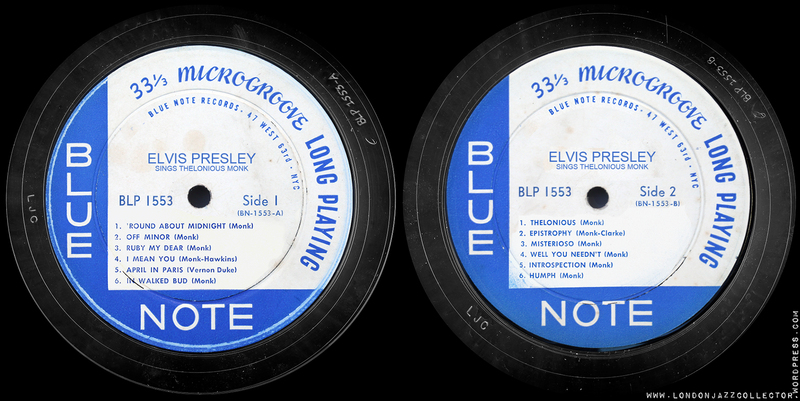 Another option is the “Blue Note Band” on the A side and Elvis’ regular band (Scotty Moore, Bill Black and D.J. Fontana) on B side. Other possible records: “Eddie Cochran plays John Coltrane”, “Gene Vincent and His Blue Caps Meet The Jazz Messengers”, “Keyboard Party” by Jerry Lee Lewis with Jimmy Smith Trio, “Chuck Berry at Birdland”, “Carl Perkins plays the Horace Silver Songbook” and even a Fats Domino record with a tenor cuttin’ contest between Johnny Griffin and Herb Hardesty. I had only heard rumors of its existence in hushed voices. So glad it’s finally making it’s way out into the sunlight. 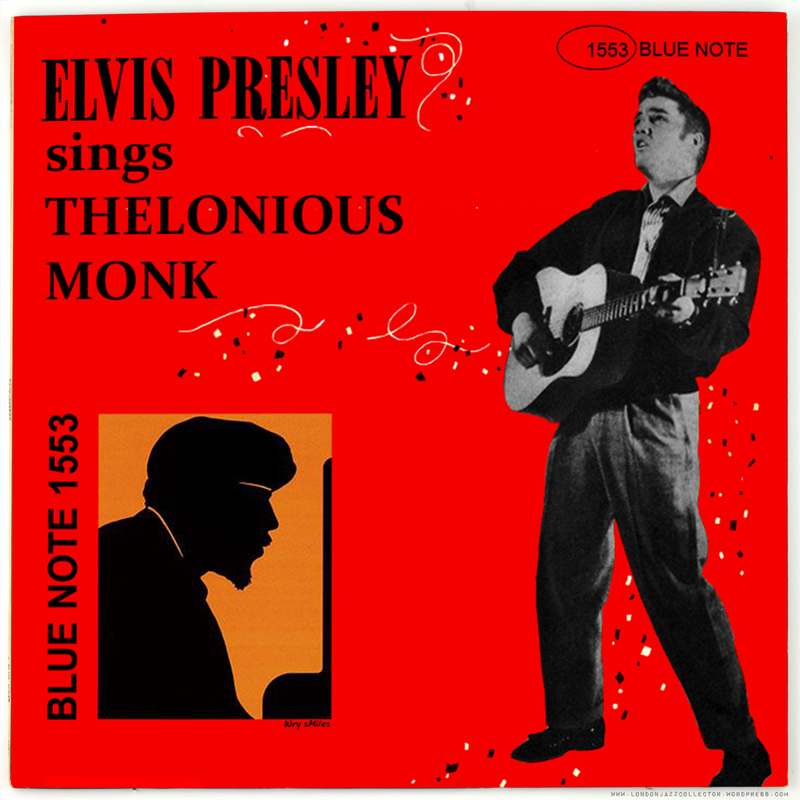 I’m sure none of us have ever heard Elvis moan and groan is such ways as he does on this album of Monk covers. I applaud your efforts LJC. Both for freeing lost records and making us laugh! Brilliant piece of jazzy investigative journalism LJC, but this unfortunately is not the original issue! The record was originally issued on a 10″ BN 5071 in 1955 with a reduced number of songs but including “Four In One” which was issued earlier on BN 5009. The 5071 cover was blank white with the following printed right in the middle of the cover: 4114! Some say that the numbers represent a cryptic message about the future, but I personally don’t believe in this hocus schmocus! How can I find more info on the rare BN 5071? I can’t find any details of this on the internet. We have a tradition of practical jokes for 1st April each year. There will be another next 1st April. 5071 was never issued, its a spoof, sorry. You were not the only one, if that makes you feel any better. One clue is the run-out, where instead of RVG, it is stamped LJC. Its all in the detail. Good wheeze though, eh? did NONE of the below people realize what day it is? I didn’t know what day it was…but it’s time to hear Melodius Thonk songs as they should be. Thank you Elvis! I’m ready for my copy, NOW! Great discovery, LJC! Unfortunately, you are not the luckiest collector in the world anymore. I was just informed by the NSA that Bob Djukic has found the last remaining BN 1553 copy, very super strong VG+++ and signed by the artists. He plans to sell it on Amazon for one cent and donate the funds to the RVG mono-tapeistic restoration project. As for shipping, well, that is another issue. We are working on it as we speak (not sure about the donation part, and it we do decide to donate, it will be to the United Caucasian Record Seller Retirement Fund). However, our copy has a different title and program: Our copy is titled: Lady Gaga performs Albert Ayler’s Greatest Hits and has deep groove on one side only. That is exactly what wiki-leaks had reported, but I refused to believe it. Please accept my bid in advance when you unearth the prequel: Peter Brötzmann sings Peter Brötzmann’s Machine Gun, from the BBC’s plugged Jazz Series. [I’m glad we all have a sense of humor, Mr. Djukic. Thank you. By the way, is it true that you have the only copy of Hieronymus Bosch’s sheet music from the Garden of Earthly Delights, engraved by the artist on a norwegian wood palette? I want it (but know I can’t have it)]. Hi. I would enjoy a copy and thanks for the find. I will gladly pay postage to the USA. 10023 postal code. Hi as a regular reader ..and french jazz fan ..is it still possible for the records ? The original story I heard was that the New Jersey mob wanted to showcase their new discovery Frankie Sinatra, and made Rudy an offer he couldn’t refuse (here’s some money, move out of your parents house). The session with Monk went fine, but when the Boss Alphonse “Big Tuna” Recordo heard the tapes, he remarked “WTF is this fold down crap? I said real mono” and scrapped the project. The Colonel brought Elvis in to overdub Frank’s’ parts, much to the joy of Nica. I would be happy to receive a copy. Thank you. “twenty mint sealed copies”. As has been extensively documented on this site and elsewhere, Blue Note did not introduce factory shrink-sealing until Nineteen-blahdy-blah and therefore claims that this is indeed the genuine missing 1553 will be highly contested. Salut! Alun wrote what I thought at a first glance.But congratulations LJC for this super idea! Would love to have a copy if still available and would gladly pay for shipping to US! And I thought I might be up early enough to be the first to congratulate you on this excellent piece especially suited to today’s date. But, no, six other cats were hip to it before I got down with it. Well done, this certainly made me smile this morning. I especially like the way you’ve “aged” the 47W43rd labels with those coffee (?) stains. Love your blog & and would be happy to hear Elvis sing Monk on original BlueNote! F@*k! Forgot the date! Again, very nicely written piece! I don’t like the cover but send me a copy anyway. Heard there was a tape of King Tubby dub mixes done from original Van Gelder multi track masters which was discovered lately. Should be interesting to listen to. Very good spotted it straight away.